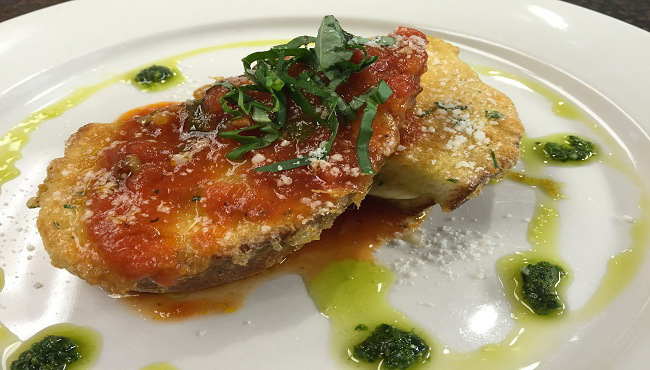 Chef Bill Andrews from Leon’s is making Baked Mozzarella en Carozza. Lay out bread on work space. Place one basil leaf on the bread slice, top with 2 slices of Mozzarella top with second basil leaf and top with second slice of bread to make the sandwich. Set aside until all the sandwiches are prepared and ready for dipping into the Milanese style egg batter. In a stainless steel bowl, beat the eggs until fully scrambled. Add the water, grated cheese, parsley, dry spices and beat again until fully incorporated. For pan frying: Add 2 cups of olive oil to a medium size saute pan and bring to a moderate heat. Gently squeeze the sandwiches before dipping into the batter to close the sandwich. Dip the sandwich into Milanese batter and fully cover. Lift it out and add it to the hot oil. Repeat the process with every sandwich. 4 sandwiches should fit into the pan. Fry on both sides until golden brown. Place on a cookie sheet pan and bake in a preheated 350 degree oven for 5 -7 minutes. The mozzarella will be nice and gooey. Heat oil, add garlic. Cook til lightly browned. Add the tomatoes. Bring to a boil, lower heat, add basil, salt & pepper. Simmer for 20 minutes.